We are not doctors, and do not intend this post as medical advice. As always, consult your healthcare provider directly when making medical decisions for yourself or your child. #1 Wash your hands with plain soap and water. Washing your hands is the single most important thing you and your family can do to help stop the spread of germs. There's nothing new about that. But new this year is the recommendation to use plain soap and warm water (not hot) as opposed to soaps that claim to be "antibacterial." New research demonstrates no advantage to soaps containing additives such as triclosan, and some possible negative side effects. #2 Make sure your child is fully immunized. While suggesting immunizations is nothing new, the new guidelines include specific recommendations for staff immunizations. If your child has not yet started an immunization schedule or is not able to be immunized, ask your pediatrician if the staff are required to have their vaccines up-to-date. #3 You don't have to wait in the waiting room. Thanks to mobile phones, you and your child are just a phone call away if you choose to wait in your car rather than in the waiting room. The guidelines suggest this alternative for well children wanting to stay away from a room full of coughs, but also to immuno-compromised children who cannot be exposed to germs. #4 Bring your own toys and books. It is impossible to keep the waiting room toys and books germ-free. Therefore, the guidelines recommend parents bring their own toys from home to avoid transmission of germs - in either direction. #5 Don't let children touch each other or common area surfaces. Parents are encouraged to not let their children touch each other or common area surfaces while at the doctor's office. This includes not letting children touch a baby's hand, discouraging close contact over a shared space, and other casual contact. Young children should be kept away from chair arms, bookshelves, and other low surfaces that they may be tempted touch, especially with their mouths. Keeping your child on your lap while waiting may be the best way to avoid this contact. #6 If in doubt, ask if it's clean. #7 Teach your children that it's ok to ask people to wash their hands. This is a tough one. We work so hard to make sure our kids are polite, but we also have to help them become good self-advocates. The new guidelines encourage parents and children to take an active role in hand hygiene. It's ok to ask your caregivers to wash their hands! Have your child practice asking "Would you mind washing your hands just in case?" #8 Ask about special office hours for vulnerable children. If your child is newborn or immuno-compromised, ask your pediatrician if they have special hours just for these types of patients. Alternatively, you can ask for the first slot of the day when the waiting room can be emptier. Either way, share your concerns with your pediatrician so that you can find a solution that works for everyone. #9 Do your research about infection control practices. There are things you can tell about a pediatrician's infection control practices just by visiting the office. Are there hand sanitizer bottles throughout the space? Do you see staff using them as they pass by? Do surfaces seem visibly clean and in good state of repair? For those things you can't see, ask. 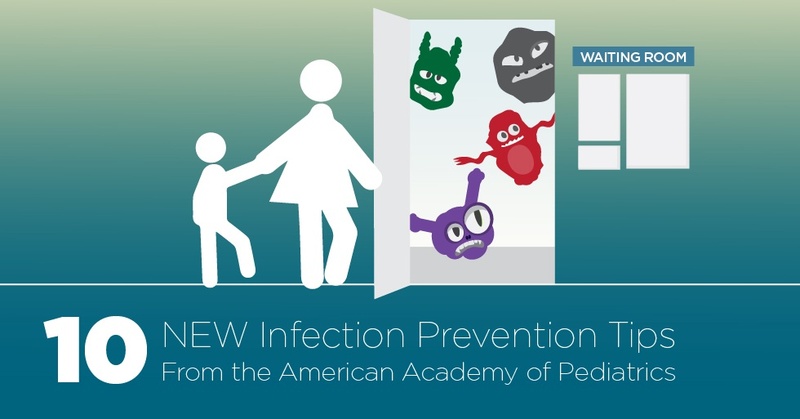 Ask your pediatrician how they handle infection control in their practice. He or she should have set policies that can be made available to you. #10 Remember the other children at the office, too. These guidelines are not all about keeping your well children away from germs - they are also about keeping your sick child away from well (or vulnerable) children. When making an appointment, tell the office about all symptoms, including rashes. If you suspect a highly contagious situation such as chicken pox or measles, tell the office in advance. This way, they can give you instructions on how to enter the office without risk of infecting other children. We hope some or even one of these tips helps you or a loved one as they care for a child. And since we take any opportunity to do so, we'll sign off by reminding everyone who can to get the seasonal flu shot!